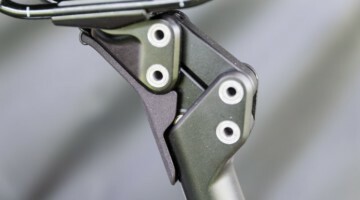 Coverage of 2019 Worlds is brought to you in part by Easton Cycling. 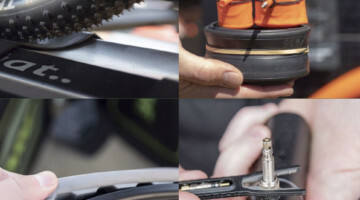 See all the new hubs, bars, stems and wheels. 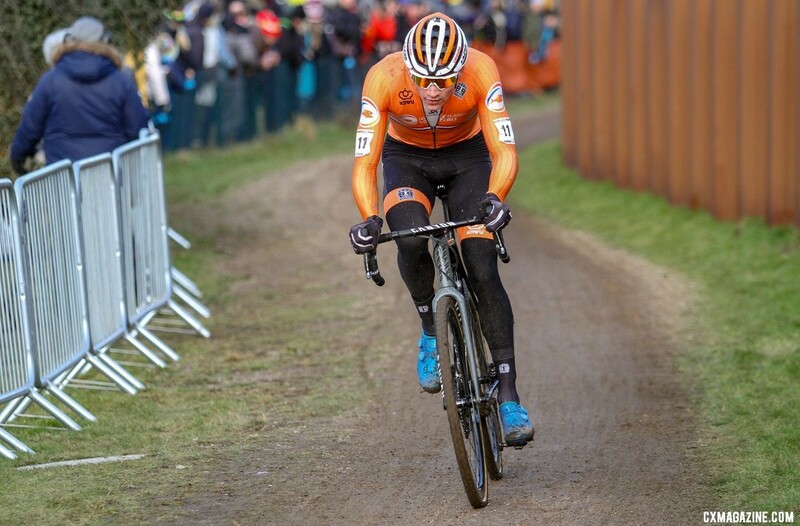 After two frustrating Worlds where he came away without the rainbow jersey despite dominating the regular season, Mathieu van der Poel (The Netherlands) was his usual brilliant self on Sunday in Bogense. 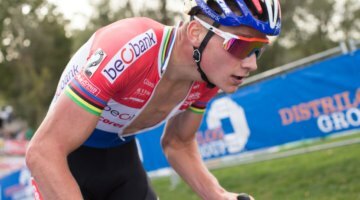 The key to Van der Poel’s second World Championship? 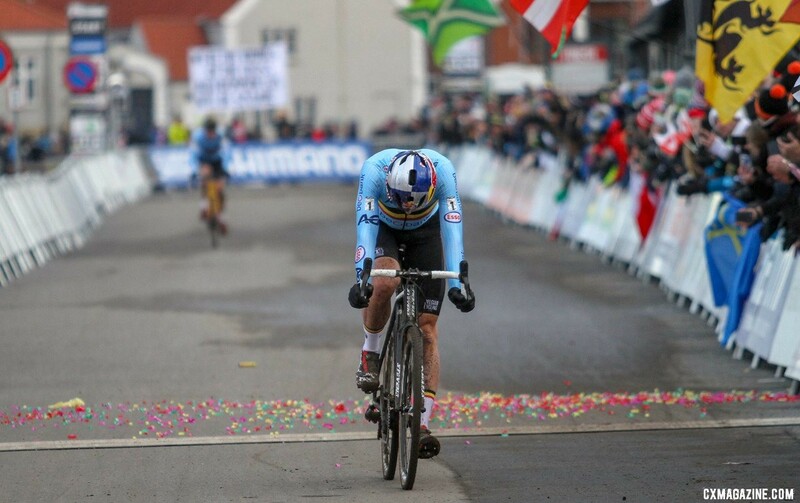 His prodigious bike handling skills on the off-camber, the most challenging technical feature on the Bogense course. In the third lap, Van der Poel railed the section and got a gap when Toon Aerts (Belgium) dabbed behind him. With Van der Poel off the front, Wout van Aert (Belgium) did everything in his power to not let the Dutch wunderkind coast to the title by powering back to catch Van der Poel at the end of four laps. 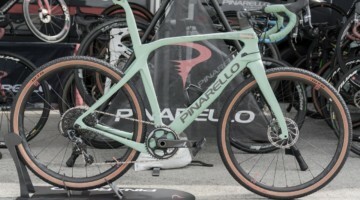 For a moment, it looked like Van Aert might rise to the occasion as he has done during his run of three world championships and give Van der Poel a race to remember. 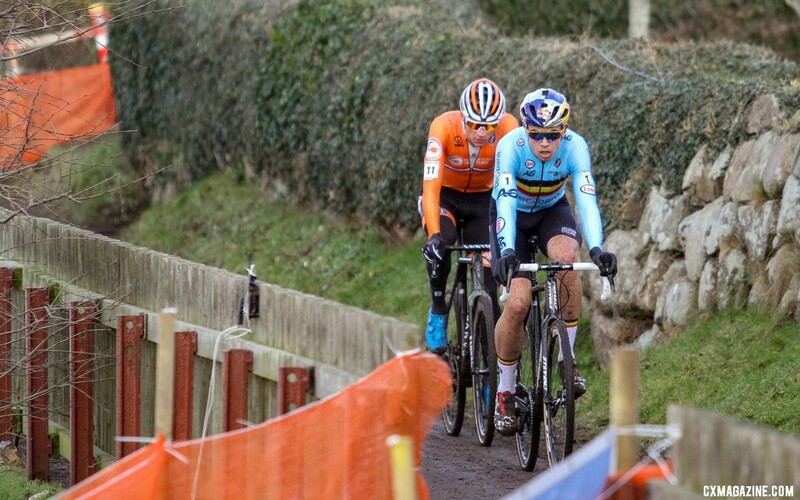 Van Aert’s challenge to Van der Poel was short-lived, lasting only until the two reached the off-camber in the next lap. After letting Van Aert lead the first half of Lap 5, Van der Poel pulled around for a clean look at the off-camber. 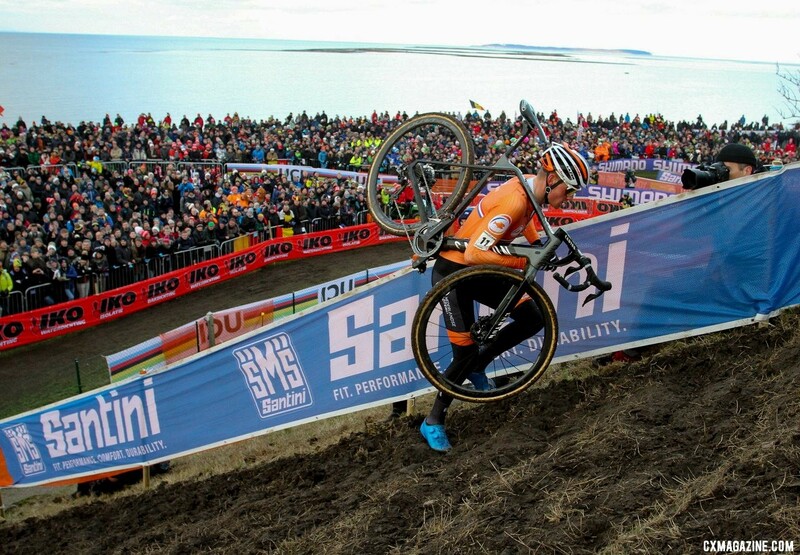 With his typical skill, Van der Poel hit the right rut and sped through the tricky section. Behind him, Van Aert dabbed trying to exit the feature. 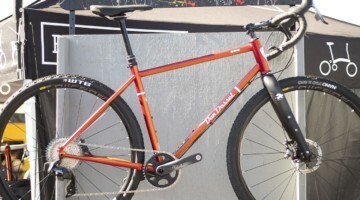 Van der Poel had a small gap on his rival. From there, it was Van der Poel dominance on the biggest stage. Six seconds at the end of Lap 5 quickly grew to 30 and Van der Poel was gone to the win. Van der Poel’s second Elite World Championship capped a season of dominance that ranks on a historical scale. 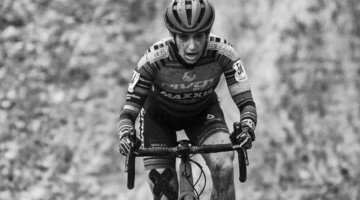 Coming into Sunday’s Elite Men’s finale at the 2019 Bogense World Championships, Mathieu van der Poel had won 25 of the 27 international races he entered this season. He came in as the odds-on favorite in a season where he has rarely been challenged deep into a race. 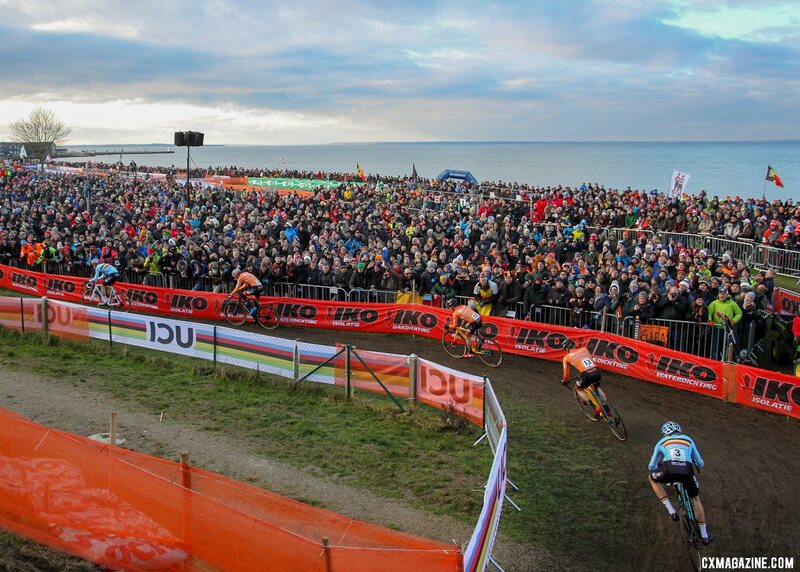 When Van der Poel ripped to the holeshot and then put in an attack in the first long straight section along the sea, the Belgian team was on red alert for a wire-to-wire Van der Poel masterpiece. 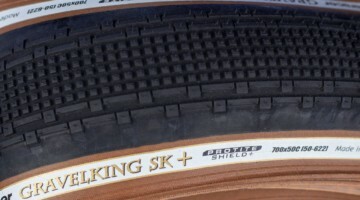 Van Aert quickly covered his wheel and the first time through the down-up-down section, Van Aert was at the front with Van der Poel and Lars van der Haar (The Netherlands). At the end of one lap of racing, a massive group of 11 massed up through the start/finish straight. At the start of the second lap, it was Toon Aerts’ (Belgium) turn to be assertive at the front. 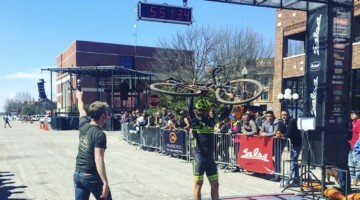 He took the lead position into the first climb at the far side of the course, while Van der Poel sat back in fourth wheel. The fast pace in the second lap helped whittle the lead selection down to eight riders at the end of two laps—Van der Poel, Van Aert, Aerts, Michael Vanthourenhout (Belgium), Corne van Kessel (The Netherlands), Laurens Sweeck (Belgium), Lars van der Haar (The Netherlands) and Felipe Orts Lloret (Spain). In the 3rd of 12 fast laps, Vanthourenhout took his turn at the front leading down the long drag to the far side of the course. 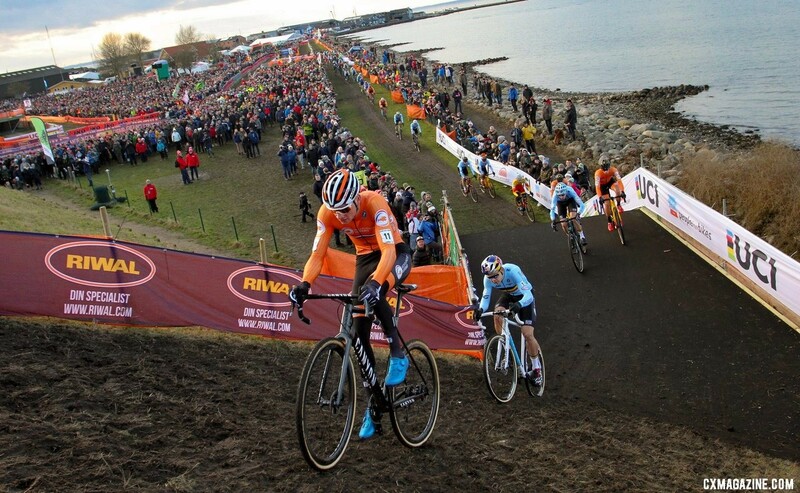 While the Belgians tried their best to hold Van der Poel off the front, the Dutchman calmly moved up to second wheel and then took over the lead leading into the off-camber. 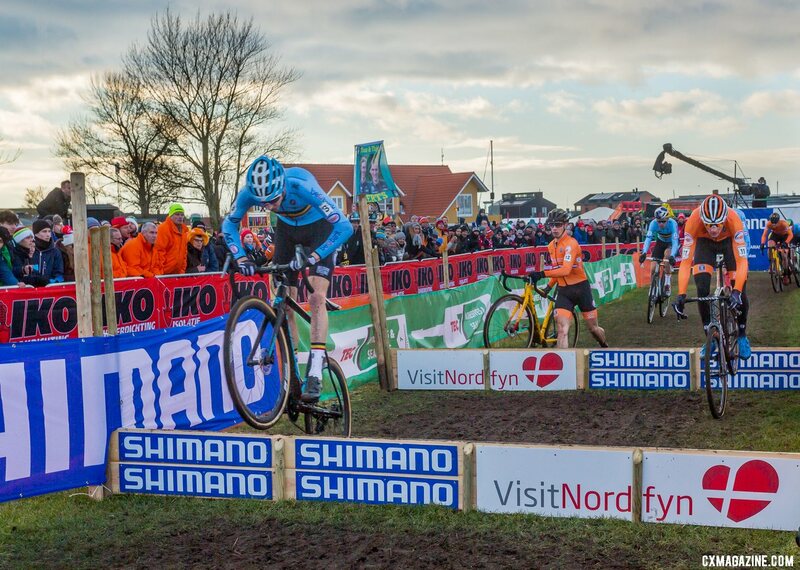 Ripping the tricky section and perfectly hitting the one rut that leads to a clean exit, Van der Poel elicited “oooohs” from the large Bogense crowd with his skill. 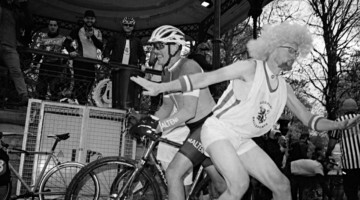 Behind him, Aerts was not as skilled, having to dab when he missed the exit rut. Aerts’ mistake gave Van der Poel his first real gap of the afternoon. 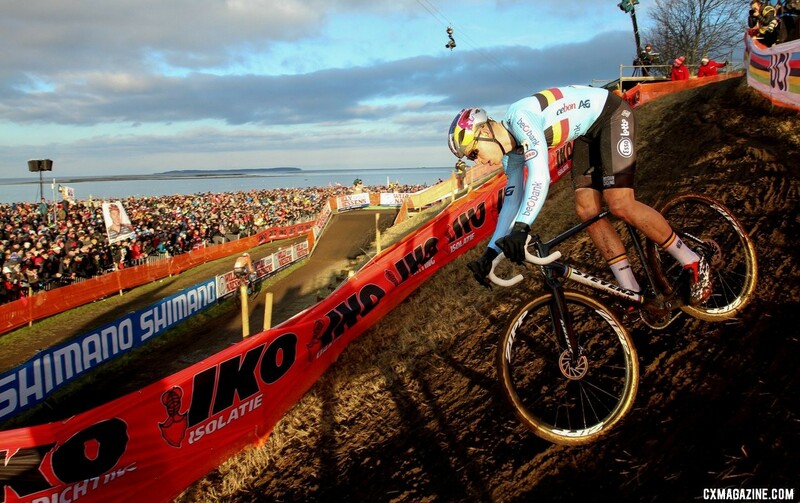 He powered along the seawall and down the straight, trying to extend his advantage on Van Aert and Aerts, the two Belgians with a real shot at catching the dominant Dutchman. Van der Poel’s lead was four seconds on Van Aert, Aerts, Vanthourenhout and Van der Haar at the end of three. 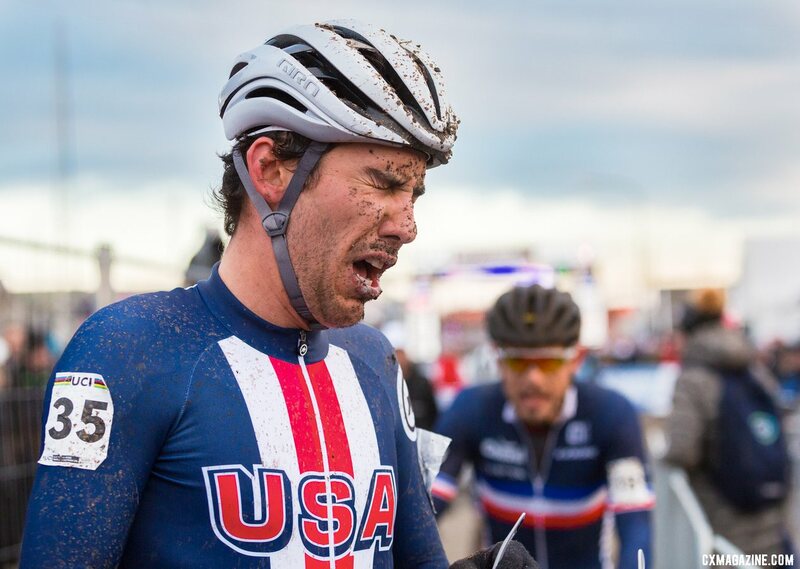 “I was a bit above my own level when I was following Mathieu with his attack, and I lost a lot of power there that I needed in the second half of the race,” Aerts said about what contributed to his mistake. 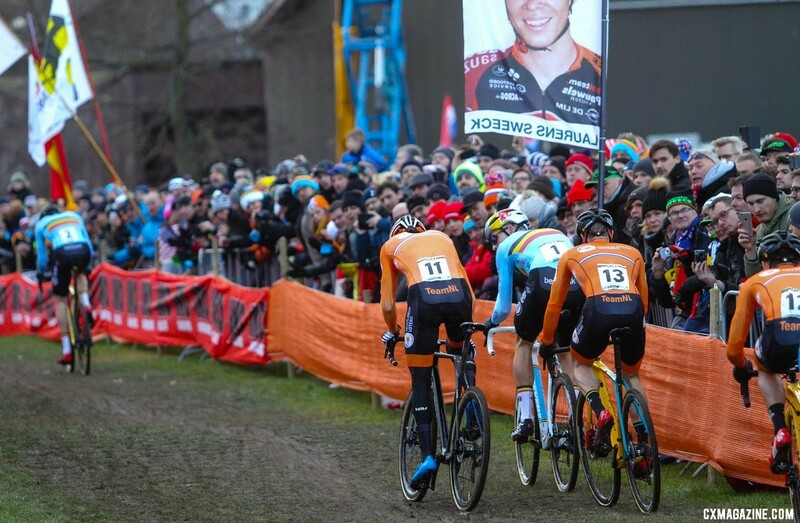 Everyone in the crowd knew what comes next when Van der Poel has a gap. 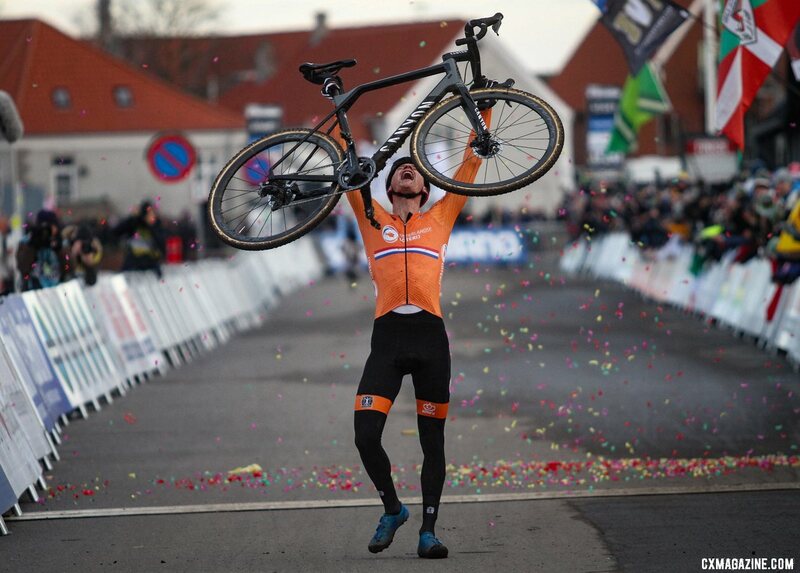 However, this time, Van Aert was going to do everything in his power to deny Van der Poel a victory going away. 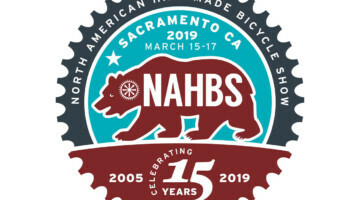 Aerts led the group into Lap 4, but when the Belgian National Champion slipped a little on a slick corner, Van Aert sprung to life to chase Van der Poel. 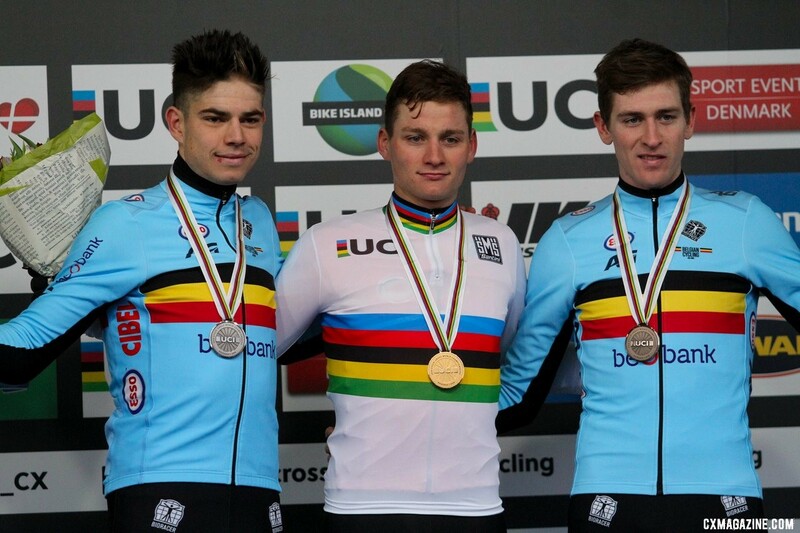 He moved into second position and charged down the long straight after Van der Poel. 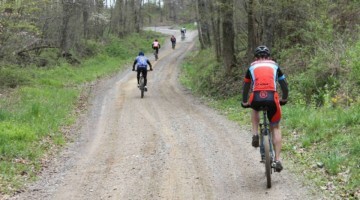 With his attack, he gapped the other riders in the group. 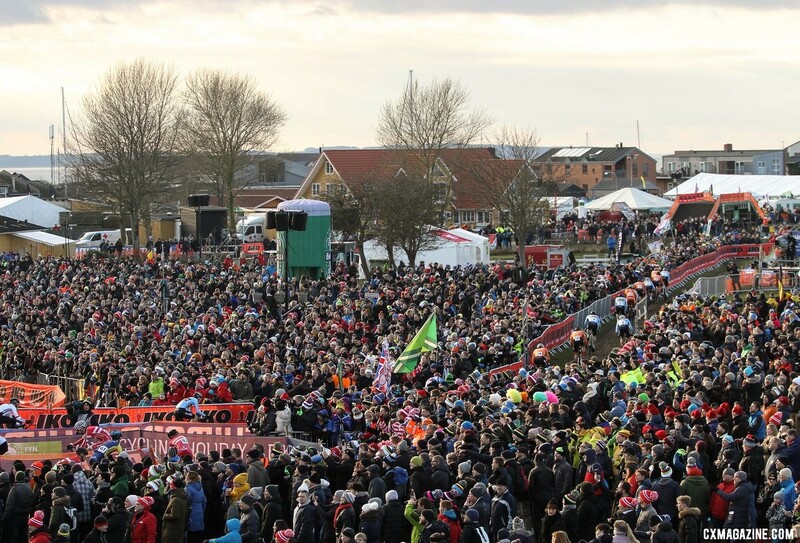 Second by second, Van Aert narrowed the gap until he caught Van der Poel on the start/finish straight, much to the delight of the large Belgian contingent that made its way to north to Denmark. 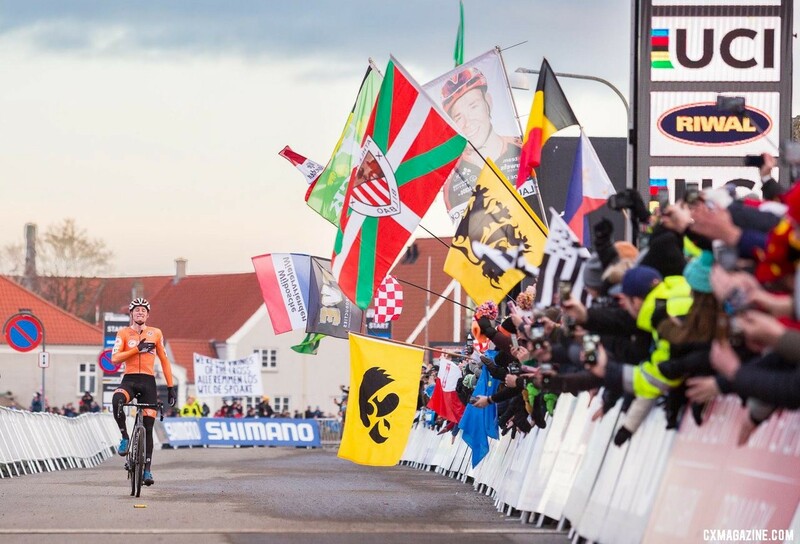 Once he joined Van der Poel, Van Aert went to the front and led the way down the long straight. Van der Poel was content to allow Van Aert to lead the way up to a point. 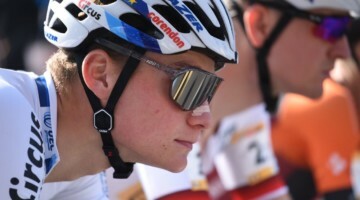 Before the race, Van der Poel noted that the off-camber was the one spot on the course that could create some separation between riders. As he did two laps previous, Van der Poel pulled around for a clean look at the feature. Van der Poel rode it flawlessly, while this time it was Van Aert’s turn to make a mistake. The Belgian dabbed on the exit, giving Van der Poel some space once again. 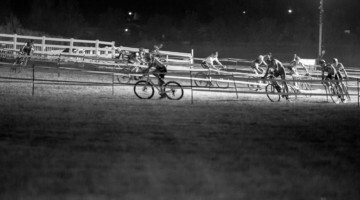 Closing a Van der Poel gap is one thing, but closing a second gap? That is a tall task for the men chasing Van der Poel’s brilliance. Van der Poel’s lead was seven seconds after Lap 5. As the next lap progressed, Van der Poel’s lead on Van Aert started to tick up. 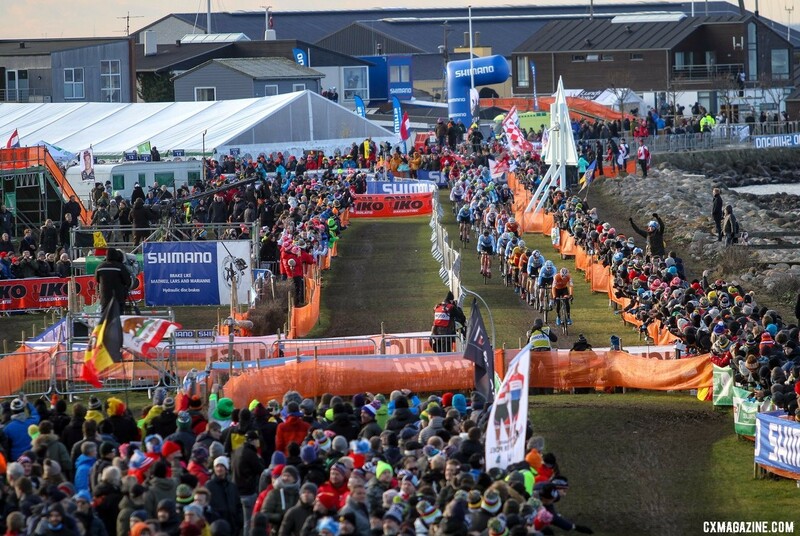 When Van der Poel hit the midway point of the race with a 14-second lead, the Bogense crowd let out a sigh, knowing what was to come. 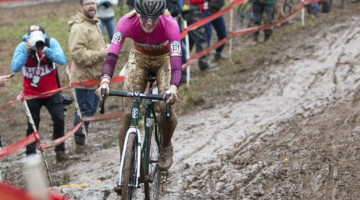 In the Lap 7, Van der Poel extended his lead to 19 seconds while Aerts escaped from the chase group after one of the Dutch riders had his share of troubles with the off-camber. The stage that has occurred so many times this season was set: Van der Poel – gap – Van Aert – gap – Aerts. The rest of the way, Van der Poel played his role perfectly. 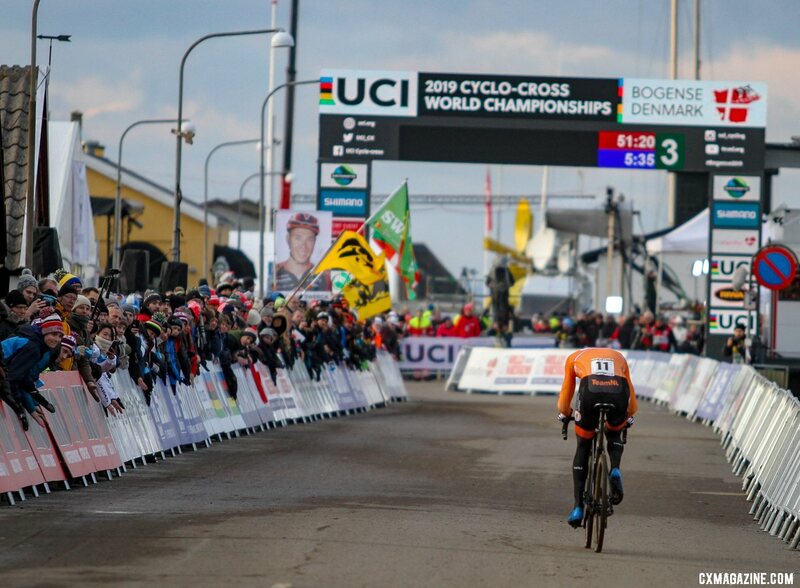 The Dutchman continued to extend his lead before taking in an emotional last lap and crossing the line, hoisting his bike up and celebrating his second Elite World Championship completed in typical dominant fashion. 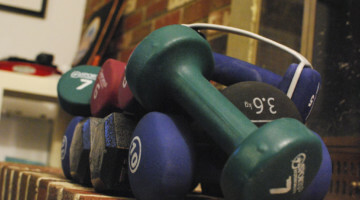 “It was a lot of weight going off the shoulders crossing the finish line. It was a very long race for me. 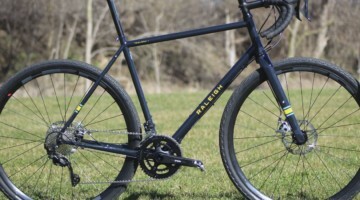 It finally comes together,” Van der Poel said. As the race progressed, Aerts started to close the gap on Van Aert. Aerts caught his countryman inside two to go, and the two entered the last lap together. 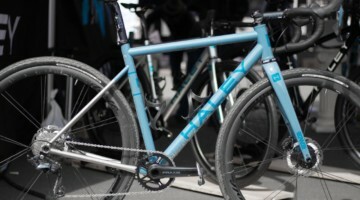 Van Aert got the best of the battle to take home second. Curtis White (United States) led the North Americans in 21st. 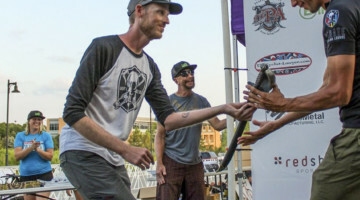 Kerry Werner (United States) finished 31st, Stephen Hyde (United States) 32nd, Michael van den Ham (Canada) 35th, Cody Kaiser (United States) 42nd, Anthony Clark (United States) 43rd and Cameron Jette (Canada) 56th. 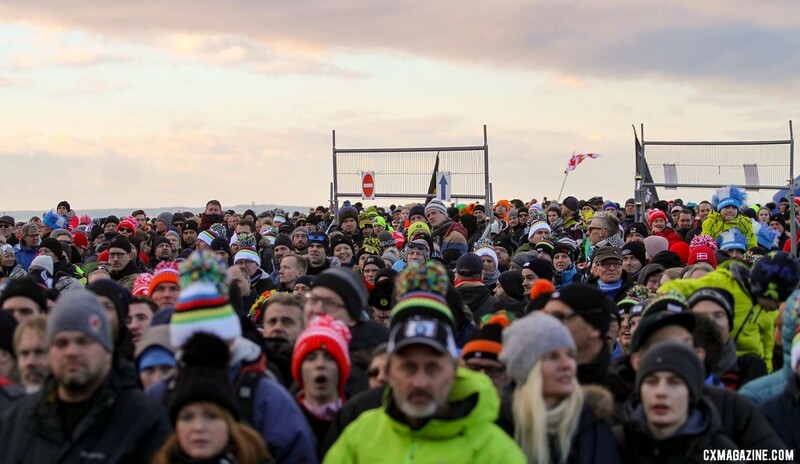 For more reports, interviews, photos and bike profiles from Bogense, see our 2019 Bogense World Championships page.